PRESIDENT Mnangagwa yesterday joined the nation in mourning people who perished during Cyclone Idai and expressed gratitude to various countries, embassies, local companies, organisations, churches and individuals who mobilised resources to assist the victims. The cyclone affected Chimanimani, Chipinge, Masvingo and Chikomba leaving more than 230 people dead and left a trail of destruction. The President attended a church service at the Methodist Church in Mabelreign, Harare and was accompanied by the Chief Secretary in the Office of the President and Cabinet, Dr Misheck Sibanda and Information, Media and Broadcasting Services principal director Mr Regis Chikore. In Bulawayo, Provincial Minister Judith Ncube expressed gratitude to all those who offered help to the affected while addressing congregants from different churches at Harvest House International as the city joined the rest of the nation in mourning the cyclone victims. President Mnangagwa said Government saw it befitting to declare two days of mourning and pray for the people who perished and those affected by the Cyclone Idai disaster. Vice President Constantino Chiwenga attended an exceptional prayer service for victims of Cyclone Idai held at St Gerard's Catholic Church in Greystone Park. In his remarks, President Mnangagwa narrated moments he encountered when he visited the affected areas and came face to face with the victims last week when he visited the stricken areas of Chimanimani. He said he also heard different heart-breaking narrations of how people died and said it is time to seek God as no one had the answer to this national problem. "As people, we do not know anything. We only get to know something after it would have occurred but God knows everything, even things to come in future. Job lost all his children and wealth but he never turned away from God. "We should accept this although it is difficult, even for me. Sometimes we ask God why He allows such things to happen and also if He still exists. "We cannot direct God but we just accept what He has done. Let us pray and seek God when we still can as disaster can come anytime and in different forms. We are all sinners and we should all go to Jesus when we are still alive," he said. The President thanked all the countries that have assisted Zimbabwe in this difficult period including the United Arab Emirates, South Africa, Tanzania and Botswana and Britain among others for the support with drugs, blankets and food among other things. He said he had received messages of condolences from British monarch, Queen Elizabeth and her family. "We have some misunderstanding with doctors here but they are voluntarily supporting people in the affected areas and I want to thank them." President Mnangagwa expressed concern that the death toll was increasing and could get to more than 200 people. "The victims have received food, clothing drugs and all the material things but the church should assist them to come to terms with the grief, so that they do not collapse inside. "We do not have answers. Today is an important day as it allows healing. We cannot continue as if nothing has happened. We have come together to express our grief and God will heal us of the trauma. The church should help us to pick up the broken pieces," he said. Elsewhere, a sombre atmosphere engulfed the Sunday second service attended by several people from the local community in Greystone Park with VP Chiwenga in attendance. The service was dedicated to the victims and families affected by the disaster as well as national healing. Father George Hama led the church service. Speaking to our Harare Bureau after the church service, VP Chiwenga made emotional remarks about yesterday's service. "In the aftermath of the disaster brought to Manicaland by the violent Cyclone Idai, today being the last day of mourning, it was important to pray for those who perished and to comfort the hearts of families of the victims," he said. "We want hope to sustain them during this tumultuous moment." "We are all the work of God and He has the ultimate say to that which He created." Meanwhile, in Bulawayo Minister Ncube thanked the community for their support. "We're encouraged and moved by the way the people of Zimbabwe have come together at this time of crisis to offer what they have to those who have been affected. I would like to thank the people of Bulawayo Province for the response to the call of duty which they have shown in the last few days. "The Provincial Administrator's office stands ready at Mhlahlandlela building to accept all donations collected for the sake of accountability and ease of transportation to Manicaland Province," said Minister Ncube. She assured the people of Manicaland Province that Bulawayo would continue to pray and support them during this difficult time. "We stand in solidarity with the people of Manicaland Province, Mozambique and Malawi who have been devastated by the cyclone. We cry to God for his mercy on the survivors who may remain in areas which are difficult to reach and for strength and wisdom for the teams who are engaged in the rescue efforts. "The number of people who have perished in the devastating conditions of Cyclone Idai continue to increase as the water recedes and the Government departments continue their work trying to account for those who are missing. We've suffered a great loss as a nation," said Minister Ncube. She said Bulawayo Province continues to express its heartfelt condolences to those who have lost their loved ones. "The loss of human lives can't be recovered and in this we share the grief of the people of Manicaland. "To every person who responded, I take this opportunity to register the nation's gratitude. Your efforts are going a long way to buttress the efforts of the Government under President Mnangagwa's leadership," said Minister Ncube. 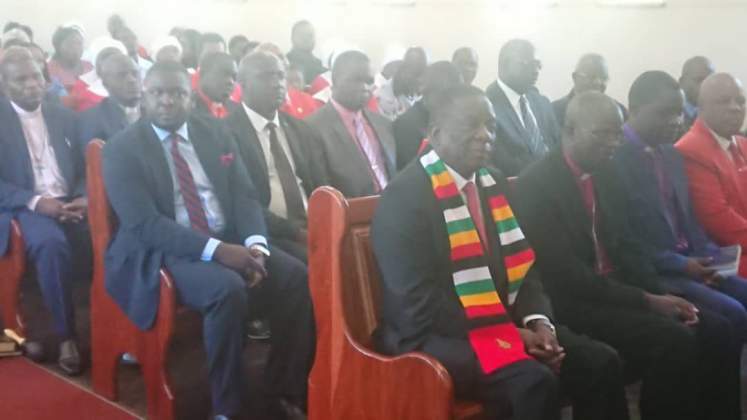 The Bulawayo prayer meeting was also attended by senior officials from Government departments, Zanu-PF, the Bulawayo City Council and other churches. Pastors prayed for the affected people and called for God's intervention in the restoration of the affected areas.